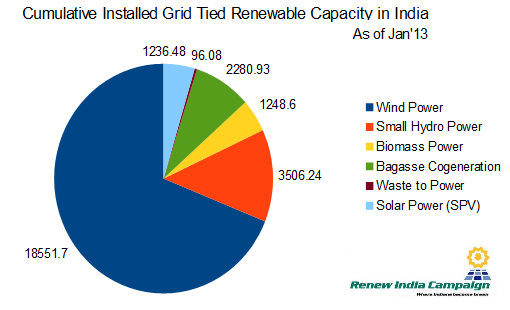 India's Renewable Installed Capacity has reached 27.7GW, as of Jan 2013. This is according to the new data released by the Ministry of New and Renewable energy in India. The Cumulative grid tied Wind Power Capacity has reached 18,551.7MW's, while Solar grid tied Power Capacity has reached 1,236.48MW's. Also during the month of January 2013, Wind Power, contributed largest share of new installed Power Capacity, while Solar PV ranked in a close second. Also the Cumulative off-grid Renewable capacity has reached 819.08 MW. Water mills/micro hydel 2.00(500 Nos.) (10 nos.) (70 nos) 2131 Nos.